KDHX Earthworms gets in touch with Handprints: Dr. Gregory Norris shares this powerfully encouraging idea with host Jean Ponzi. A lot of enviro-info dis-credits our human species for the impacts of our “footprints” on Earth’s systems, and on beings other than ourselves. Scientist and public health advocate Greg Norris was inspired, while working with Life Cycle Analyses, to look up from Footprints and focus on the human part that can collaborate, create and restore. “Handprinting” has become a vehicle to encourage and measure our capacity to be a benefit on Earth. Beneficial actions – and the ripples of influence they create – can now be measured through a key piece of Norris’ work-in-progress, the app Handprinter.org. 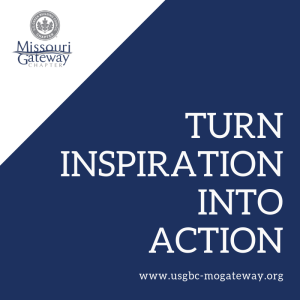 Join the USGBC-Missouri Gateway Chapter this spring to be inspired by those making a difference locally, regionally and globally. Gain momentum and inspiration while accessing tools and programs that you can use to drive positive change. 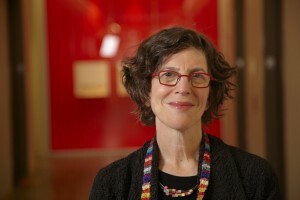 Norris is co-director of the Sustainability and Health Initiative for Net-Positive Enterprise (SHINE) at the Harvard School for Public Health, and chief scientist at the International Living Future Institute. His concept of ‘Handprints’ was featured on the front page of Time Magazine in 2012. This free event, which is open to the public, is the culmination of the 2018-19 Green Schools Quest – a project-based challenge to K-12 schools to implement a sustainability project over 6 months with the help of a USGBC-MGC Green Mentor. 59 school/mentor teams in the St. Louis region are participating this school year. Drawdown EcoChallenge, offered by EcoChallenge.org and Project Drawdown, is a fun and social way to take measurable action on the top solutions to global warming. 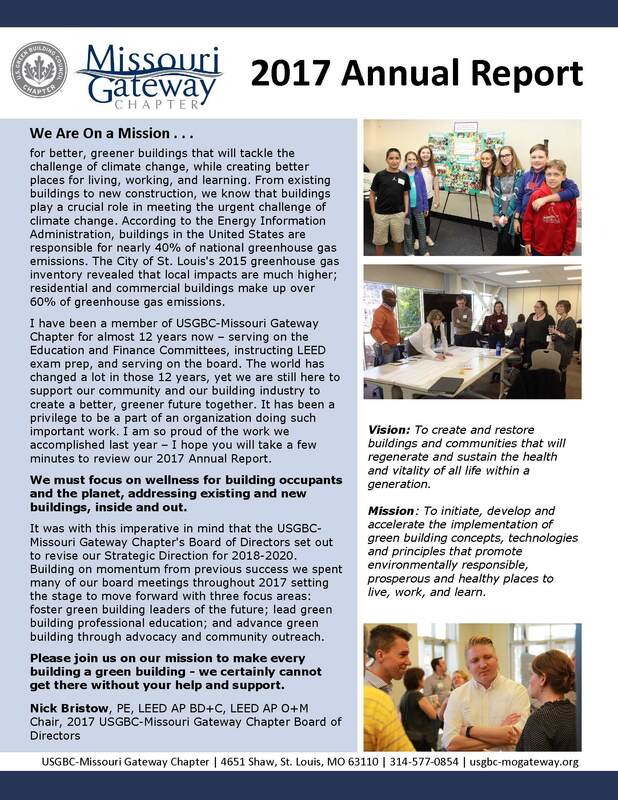 Join the USGBC-Missouri Gateway Chapter team to see how three weeks of action add up to a lifetime of change for you and the planet. The challenge takes place from April 3 – April 24, and is free and open to the public, and registration is open now. 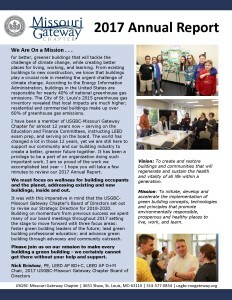 Join the USGBC-Missouri Gateway Chapter team here. May 14 – Regional Green Building Challenges and Successes – How can we improve? A panel of design, construction, development and business ownership professionals will discuss national and regional green building progress to date, regional success stories and challenges, as well as opportunities to build momentum. Audience members will be engaged in actively examining how we can learn from today’s successes and challenges to better guide clients towards pursuing best practices in sustainable design and construction. The United Nation’s 17 Sustainable Development Goals were adopted in 2015 to “promote prosperity while protecting the planet.” The 17 Goals are wide-ranging, challenging humanity to decouple economic growth from climate change, poverty, and inequality. Green building supports many of the Sustainable Development Goals by reducing waste and contributing to healthier physical environments, but also by educating, creating jobs, reducing inequalities, and strengthening communities. 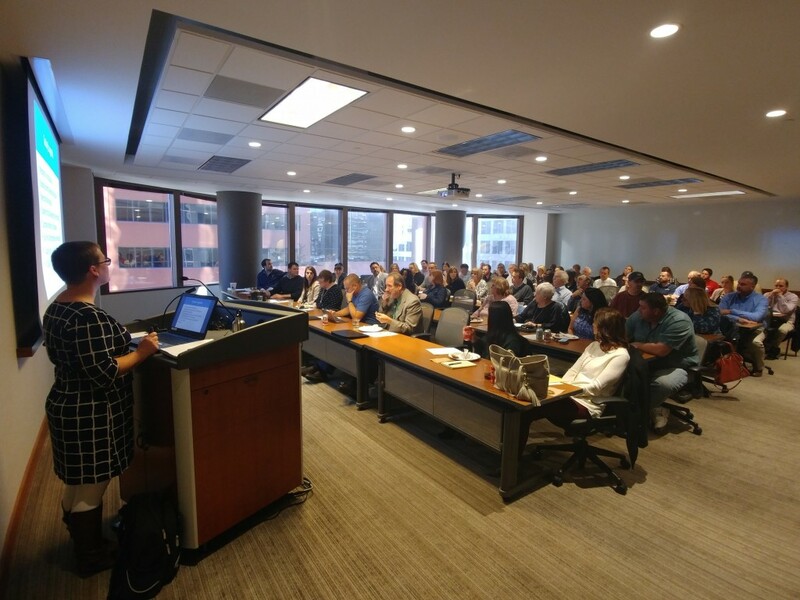 At this in-depth session, learn more about the UN Sustainable Development Goals, their relevance to the St. Louis-area green building industry, and how to use them to better communicate and advance partnerships. We are excited to announce that USGBC-MGC will now house the St. Louis Region Collaborative of the International Living Future Institute (ILFI). We hope you’ll join us at the ILFI- St. Louis Launch Event on August 2nd and get involved with our new ILFI committee! The International Living Future Institute, based out of the Pacific Northwest, is the creator of a number of forward-thinking certifications and initiatives related to the built environment – including the Living Building Challenge, Declare Label, and JUST program. All of these programs are rooted in ILFI’s mission to lead the transformation toward a civilization that is socially just, culturally rich, and ecologically restorative. The August 2nd launch event will take place from 4 to 6 pm at the Jan Phillips Learning Center (JPLC), a living example of the ILFI’s programs. The JPLC, owned by The College School and located in Pacific, MO, is currently seeking the Living Building Challenge Certification. The learning center features semi-permeable pavers, wind and solar energy, 360-degree views and a strong commitment to hands on learning for students. The launch event will follow a seminar on the Living Building Challenge, highlighting features within the JPLC that make it a truly living building. By combining resources, USGBC-MGC and ILFI will collaborate to continue promoting green building design, construction and operations – and to fortify consideration for not just our buildings, but also the people inside them and the surrounding communities. 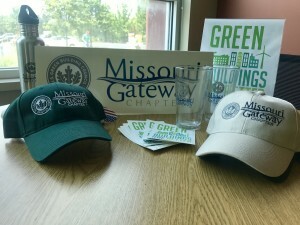 As an affiliate of the International Living Future Institute (ILFI), all members of the USGBC-Missouri Gateway Chapter receive a FREE Basic Living Future Institute Membership. 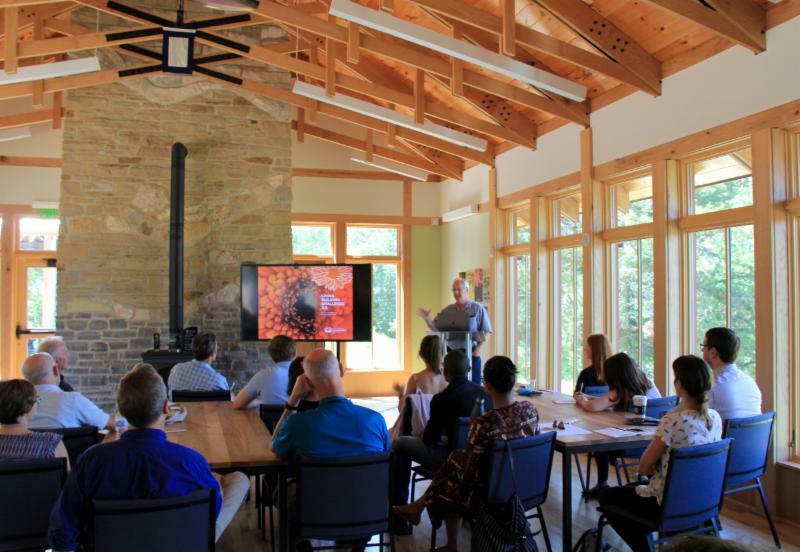 Basic Membership with the International Living Future Institute offers valuable benefits, including complimentary online education about the Living Building Challenge, ability to become a Living Future Ambassador, and discounts on workshops, books, and more. Current USGBC-Missouri Gateway Chapter members can log in here to access instructions on how to redeem their complimentary Living Future Institute membership. Click here information on the JPLC Living Building Seminar and ILFI-St. Louis Launch Event. If you’re interested in getting involved with our new ILFI committee, please contact hope.gribble@mobot.org. USGBC-Missouri Gateway Chapter is accepting proposals for educational programs to be offered in 2019. Call for Proposals Issued May 24, 2018. Proposals due by Friday, July 27, 2018 at 11:59 PM CST. Selected Speakers notified by October 8, 2018.